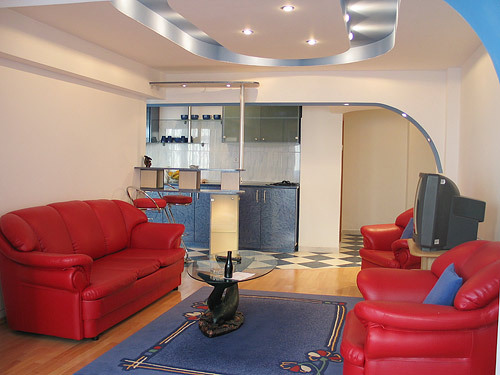 Rent Bucharest apartment with EastComfort. 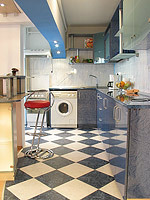 Our agency manages over 50 quality rental apartments in Bucharest. Select an apartment in Bucharest by price, the number of guests or by our recommendations. The Unirii Blv, RENTED FOR LONG TERM!!! This short term business class apartment is located in a safety building with security service and nice entrance. A modern layout and in the same time the confort, its red sofas and armchairs, the minibar, turn this apartment into a place for bussiness meetings, but also for leisure time. Up to 4 people may stay in a beautiful home for a fair price. The bedroom has double bed, TV set. The endowed kitchen serves any self-catering tastes, while the bathroom (bathtub, power shower), might become your second resting place. You can enjoy now the red-blue combinations, the intimacy and comfort of this flat. 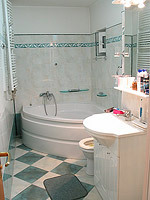 Rent now our Bucharest apartment! This Bucharest apartment is set in the economical and historical centre of the city, a very safety area, full of entertainment opportunities(clubs, restaurants, bars), but there are also a lot of facilities for business travellers.